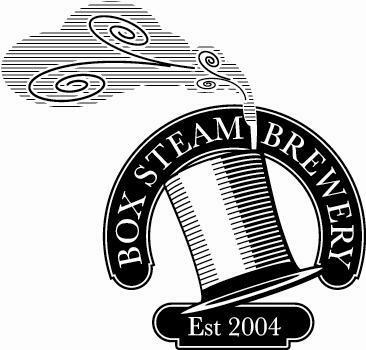 For this week's Beer of the Week I found a beer from Box Steam Brewery located in Wiltshire, England. Wiltshire, apparently, is not too far from Box Tunnel, a two mile long railway tunnel built in the 1840s, which at the time, was the longest railway tunnel in the world. The reason I bring this up is that all the names of their beers have a railway reference to them. 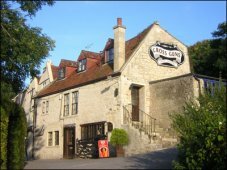 The brewery was founded in 2004 as a hobby by Marshall Ewart and Mark Hempleman-Adams, using equipment they inherited when Bath Ales moved to a larger location. In 2005 ,the owner of a local pub, Cross Guns (pictured right), did not receive his shipment of beer from the major brewery who supplied him and was looking at not having beer for his customers on a public bank holiday. Fortunately, Box Steam Brewery had just visited and left their business card. After a call, Box Steam supplied them with beer for the holiday and became a permanent offering at the pub. A year later when the brewery was put up for sale, it was purchased by the owners of the pub. The brewery was then run by Gordon King, a former teacher, and Andrew Roberts. Marshall and Mark did stay on for three months to show Gordon and Andrew the ropes. They must have done well as there beers have won the Beer of the Festival Award for the third year in a row at the Chippenham Campaign for Real Ale festival. Dark and Handsome was the winner in 2008. I mentioned earlier that the names of their beers are all railway connected. 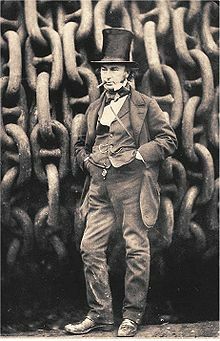 Dark and Handsome is named after Isambard Kingdom Brunel, (pictured left), who was an engineer who designed first major British railway, the Great Western Railway and Box tunnel which the railway runs through. he was known for always wearing a top hat, which is a feature of the companies logo, and chomping on a cigar. Dark and handsome is the strongest regular beer the company produces at 5% APV. It pours very dark brown in colour. I was surprised as I expected an ale not a stout. The beer had a short bubbly head which dissipated quickly. There also was no lacings along the side of the glass. I'll have to try a different glass for the second round. It is a very nice stout, though. Very creamy and full of flavour. The bottle says it's a "creamy beer with hints of lemon, blackcurrant and licorice undertones." The creaminess I have already mentioned but I did not get those other flavours. I do pick up a chocolaty flavour throughout. It is a bitter stout, one which I really enjoy. The second bottle I poured into 2 separate glasses. Again the head dissipated quickly bu t now I could see the lacings down the inside of the glasses. My fault on the first pour. The label lists only water, malt and hops as the ingredients, although one has to know that yeast has to be involved too or there would not be any 5% alcohol. Once again, though, it was a delicious beer and when it comes down to it, that is the most important feature of a beer. The Box Steam website say that although they are a local brewery but have wholesalers who have sold their beer to such far away places as Finland. 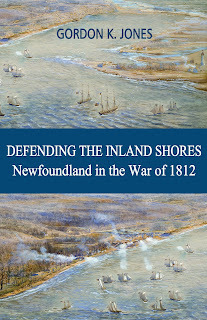 Well, Canada is a lot further from Wiltshire England, than Finland, and I for one am glad their Dark and Handsome made it to Toronto.